Among several projects, the Edelstam Foundation is currently working on “Human Rights, Civic Courage and Heroes” that aims to inform and educate about the content of United Nations Declaration of Human Rights (UNDHR) by portraying Human Rights and the importance of each article, relating them to concrete examples through the use of real heroes in order to inspire people to show civic courage. 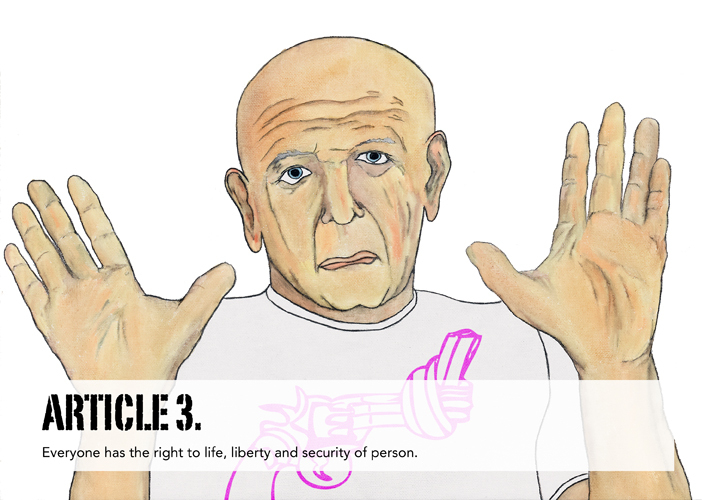 By combining the Human Rights and exemplifying them with heroes who have played an essential role in relation to each article of the UNDHR, we will make the concept of Democracy and the content of UNDHR available to everyone, through art, literature, discussion, and physical expression. Through this project the Edelstam Foundation portrays, distributes, discusses, and dances Human Rights. The exhibition, which portrays each article in the United Nations Declaration of Human Rights (UNDHR), is painted by the artist, Mr. Carl Adam Cronstedt, and will be staged on controversial sites around the world and the first location is the National Stadium in Chile. Requests have been sent to exhibit the portraits of Human Rights at Guantanamo Base, Memorial da Resisténcia in Sao Paolo, the Vatican State (Sixteenth Chapel), and at the former concentration camp at Auschwitz. The exhibition is part of an extensive educational project “Human Rights, Civic Courage and Heroes” aiming to inform and educate about the of UNDHR by portraying Human Rights and the importance of each article, relating them to concrete examples through the use of real heroes in order to inspire people to show civic courage.